Find and compare the best prices from a range of well known car rental companies at Rijeka Airport. This is a free to use facility, enabeling you to book direct with the company quoting the price. 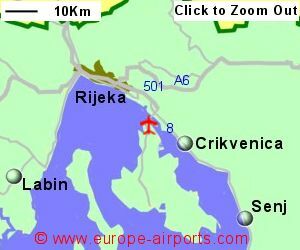 Rijeka Airport, otherwise known as Airport, is located 20Km south east of Rijeka, on the Adriatic coast of western Croatia. Rijeka is Croatias third largest city and main seaport. A bus service between the airport, Rijeka city, and surrounding areas, is timed for each flight, with a journey time of 30 minutes. Facilities include a bar/restaurant and duty free shop, VIP lounge. 142,000 passengers passed through Rijeka airport in 2017, a 2% decrease from the previous year.